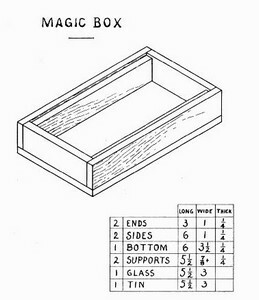 This is truly a magic box to those who do not understand how it works. Who would ever think that these little bits of people would hop up and down inside their house just because their window was rubbed with a piece of leather? Try it and see how excited they get. If the worker can cut glass, make the box first, otherwise he must get a piece of glass 5-1/2" × 3" and build the box to fit it. It requires careful work to make a good box, so be sure that all ends and edges are square and that corresponding parts are the same size before nailing it together. Plane all such small boards in the bench-hook. Make the ends first 1" wide and as long as the glass is wide. Make the sides the same width and as long as the glass, plus the thickness of the two ends. Glue and nail these to the ends, keeping the bottom edges flush. Set all nails with a nail-set. One edge and one end only of the bottom should now be planed square, the other edge and end being left to plane after the bottom is nailed in place. Cut a piece of tin 1/16" smaller than the glass, or glue some tinfoil on the inside of the bottom. If tinfoil is to be used, smooth it on a piece of paper carefully with the fingers; then spread some glue thinly over the bottom, and lay the tinfoil on it. The squared edge and end of the bottom are to be nailed first, having them fit nicely; then the other edge and end. Never drive a nail too near the corner of the bottom lest it strike the nails driven thru the sides of the box. Now plane the end and then the side of the bottom to fit. If tin is used instead of tinfoil put it inside the box after the bottom has been nailed in place. Make the two supports fit inside the box lengthwise and just wide enough to hold the top of the glass flush with the top edges of the box. To hold the supports, drive nails thru the ends of the box into them. Everything about electrical apparatus should be clean and dry, so, as this is really an electric box, have the glass and tin clean before using it. Put some bits of charcoal, paper, straw, or sawdust into the box, have it warm and dry, rub the glass with a piece of leather (glove, shoe), and then see how the little people jump! The explanation is as follows: Rubbing glass with leather, fur, woolen, or silk generates electricity; this electricity attracts non-electrified bodies, thus lifting the little people to the glass; as soon as they become charged with the electricity on the glass, they are repelled and thrown down to the tin; the tin conducts their charge of electricity away, and they are ready to begin their circus over again.